Springfield-Parkway Presbyterian Church Came began its existence back in January 26, 1938 when a Sunday School was organized in a vacant store building at the corner of the Wewa and Coastal Highways. In the fall of 1959, Springfield Presbyterian Church relocated to the present location and changed its name to Parkway Presbyterian Church. The stained “glass” windows were installed in 1985. All of the windows are timeless gift given to the church as memorials. The Chancel window was given in memory of Arvie and Oscas Barnes. The light shining in on the cross gives people the opportunity to worship within the light of God. The golden rays of the sun symbolize Christ. The background, shades of all of God’s colors, symbolizes the seasons of the earth, our lives and the church. In the evening, with the sun bathing the window from the outside, the vibrant colors of the window radiate to make a most spectacular sight. On the right side entering the sanctuary, the first window is simply called Son. The Lamb of God symbolizes Christ’s sacrifice of himself to human death on the cross. The victory banner carried in the front foreleg is symbolic of Christ, triumphant over death through His resurrection. The halo surrounds the head of the Lamb of God and is a symbol for glory, purity and magnificence. On the left side entering the sanctuary is the Ten Commandments window. These tablets of stone represent the many manifestations of the law handed down to Moses by God. Surrounding the Commandments is the Tree of Life, symbolizing the continuation of life in Jesus Christ. The green color in the leaves of the tree represents new beginnings, renewal and spiritual growth. On the left side entering the sanctuary is the Nativity window. The manger is symbolic of God’s appearance in the human arena. Heavenly rays from the bright, shining Star of Bethlehem shine down from above and bathe the birthplace of Jesus with brilliant radiance. On the right side entering the sanctuary, the second window is called Transfiguration. The Chi Rho Cross represents the culmination of Christ’s glory in heaven and on earth. When viewing this window from the hallway, the tablets with the Ten Commandments come clearly into view. 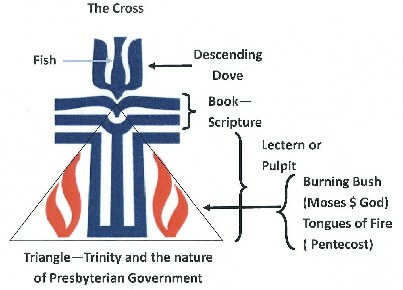 The basic symbols in the seal are the cross, Scripture, the dove and flames. The dominant structural and theological element in the design is the cross – the universal and most ecumenical symbol of the Christian Church. Looking more closely at some of the visual components of the design, viewers may discover elements that seem to fuse with some of the more obvious theological symbols.